Greens Farms Academy's Griffin Garner, 3, of Westport, and junior Anders Forfang, 10, were strong contributors in GFA's 2-0 victory over St. Luke's last week. 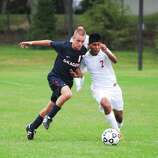 The Greens Farms Academy boys soccer team (4-6-1) defeated St. Luke's, 2-0, but lost 1-0 to Rye Country Day School and 2-0 to King. 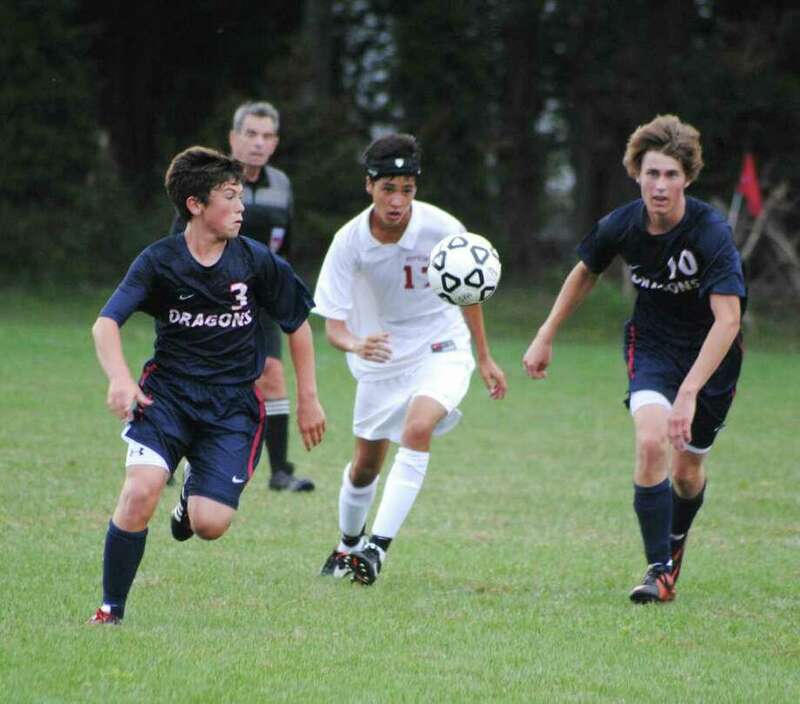 Against St. Luke's, Griffin Garner (Westport) and Spencer Hartig scored for the Dragons. Goalie Ryan Friend along with Van Barnet, Charlie Salmans, Clay Garner (Westport) and JT Becker (Westport) anchored the defense. Harry Garland (Westport), Munir Qaddourah, Ryan Eckert, Anders Forfang, Brendan Bieder and Wyatt Cook (Westport) controlled the midfield. Friend made some tough saves against Rye. Sebastian deGoeijen played well against King. 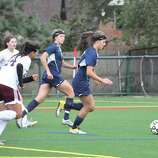 The GFA girls soccer team tied Suffield Academy, 1-1 and defeated King, 3-1, last week. Against Suffield, Emily Caldwell scored on a direct kick, which Phebe Wong drew when she was taken down on a breakaway. Caroline Kruk had eight saves. Wong, Caldwell and Olivia Lennon scored goals against King. Blair Pelley and Caroline Vanacore had assists. Kate Tomlinson, Sam Brown and Kruk (four saves) led the defense. The GFA volleyball team (5-4) defeated St. Luke's, 3-0 and lost to King, 3-0, last week. Lucy Hoffman (seven digs), Westporters Rachel Schwimmer (six digs) and Sarah MacDonell (17 assists), Kiera Wood (eight kills), Sarah Young (seven kills, four aces) and Brooke Cirillo (six aces) led GFA against St. Luke's. Young (seven kills), Laura Reul (seven blocks, five kills) and MacDonell (14 assists) led the way against King. The GFA field hockey team (3-6) defeated St. Luke's 2-1 in overtime and lost 3-1 to King last week. Madison Leonard (Westport) set up goals by Olivia Taylor and Caitlin Rummelsburg against St. Luke's. Midfielders Maggie Sherin (Weston) and Hayley Holzinger played a strong game alongside Leonard. Isabelle Canaan, Ashley Hutchison (Westport), JJ Rattray and Juliet Fontana played well defensively in front of goalie Jenny Ross (seven saves). Against King, Rummelsburg scored the Dragons' goal. Fontana, Hutchison and Ross (14 saves) led the defense.